Surrounded by hills and drenched in history and myth Rajgir is a 3000 year-old city still holding strong to its roots. Here, Lord Buddha stayed and preached and even initiated the mighty king Bimbisara whereas Lord Mahavira spent fourteen years of his life preaching in Rajgir. World travellers like Hiuen Tsang (650 BC) and Fa-Hein (400 BC) visited Rajgir and meticulously recorded its daily life and people. Rajgir is even older than history – still today believers visit a dilapidated wrestling ring where the Pandava prince Bheema, is said to have fought and killed Jarasandha. Strange marks on the rock are believed to be the chariot wheel marks of Lord Krishna and an un-deciphered script on a rock face is said to contain the code to open the store of gold of a mythical king. Lakes hidden within hills, ropeways leading to peace pagodas located on hill tops, hot springs and horse cart rides make Rajgir a mixed bag of surprises. Places to see at Rajgir: The caves of Gridhakuta was home to Lord Buddha for three months of the year and from this hilltop he preached some of the most precious sermons to his disciples. The Venuvan garden marks the site which King Bimbisara offered Lord Buddha to reside. A ropeway leads to the Vishwa Shanti Stupa, built by the Japanese on a hilltop to spread Buddha’s message of peace. 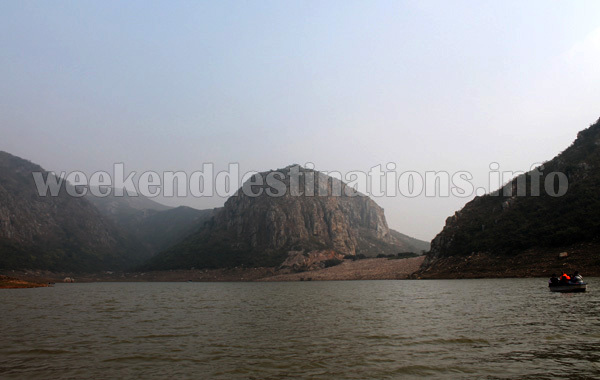 The Ghora Katora lake just 7 kms on the outskirts of Rajgir within the hills and forests is another great place to do some boating and wind up. Rajgir finds a very important place in the life of Lord Buddha and Mahavira. Here, you can still locate the dispensary of the royal physician Jivak where Lord Buddha was once brought to have his wounds treated. Then, there is the Jarasandh Ka Akhara where it is said that the Pandava prince fought against Jarasandh. The sulphur hot springs of Bramhakund, the mythical chariot wheel marks of Lord Krishna and the 40 kilometer long pre Mauryan Cyclopean Wall whose remains in few areas can still be traced supposed to have encircled ancient Rajgir. Various caves, temples and remains of ancient jails and fort walls dot Rajgir. 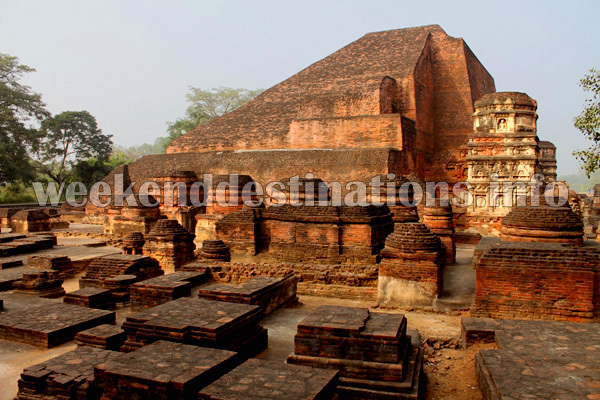 Nearby attractions from Rajgir: The most popular nearby destinations of Rajgir are Nalanda, Pawapuri and Bodhgaya. 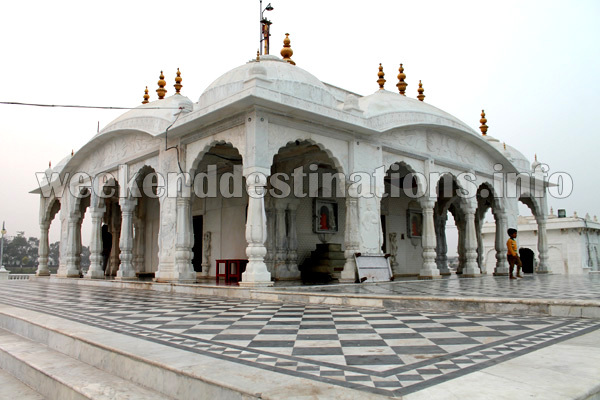 Holy town of Pawapuri: Just 38 kilometers from Rajgir is Pawapuri – the holy site for Jains where Lord Mahavira, the last of the 24 Tirthankaras was cremated. It is said that the frenzy to collect his ashes by his followers resulted in the removal of so much soil that a lake was created. 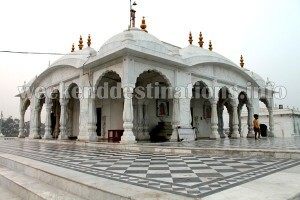 Presently, a beautiful Jalmandir (water temple) built in white marble stands hear within the lotus lake. There is another nearby site called Samosharan, where Lord Mahavira delivered his last teachings. The peace pilgrimage of Bodhgaya: This is the holiest place on earth for Buddhists from all over the world because Lord Buddha attained enlightenment here in 500 BC. After three days of meditation, prince Siddhartha attained enlightenment and became Buddha under the Bodhi tree. The seat where he meditated under the Bodhi tree, the Bodhi tree itself (this is the 5th generation of the original tree), and all the spots where he meditated during the seven days after his enlightenment are marked within the Mahabodhi Temple Complex. The primary attraction of Bodhgaya is the Mahabodhi Temple Complex probably built by King Ashoka in 250 BC. The temple is now a UNESCO World Heritage Site. Things to do in Rajgir: While going to Nalanda from Rajgir, you can stop at Silao for a treat of local snack called Khaja. You can take the local sightseeing trip in a horse cart too. You can also do boating at Ghora Katora lake, take the chair lift ropeway to the Peace Pagoda and enjoy a hot bath at Bramhakund Hot springs. As Rajgir is surrounded by hills on all sides so a short trek to any temple located on a hilltop can be enjoyable. How to reach Rajgir: There are direct trains from Howrah to Rajgir. 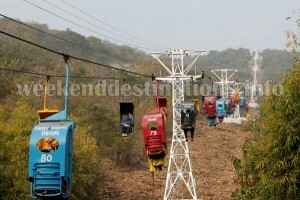 You can also get down at Bakhtiyarpur Station and then take a car to Rajgir (55 kilometers). There are night buses from Kolkata to Rajgir – it takes around 10 hours. Rajgir is also well connected from Gaya Airport (77 kms) and Patna Airport (109 kilometers). Best time to visit Rajgir: You can visit Rajgir anytime of the year but the summer months of May and June are a bit scorching. 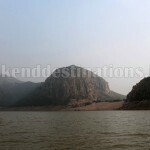 Winters and monsoons are great for visiting Rajgir. 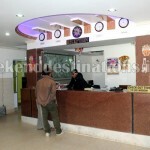 Hotel near market area: A reasonably priced deluxe-category hotel located near the market area with modern facilities like nice spacious rooms with attached western bathrooms, dining hall, television, car-parking, hot water geysers, Air Conditioning, 24 hours silent generator and elevator. 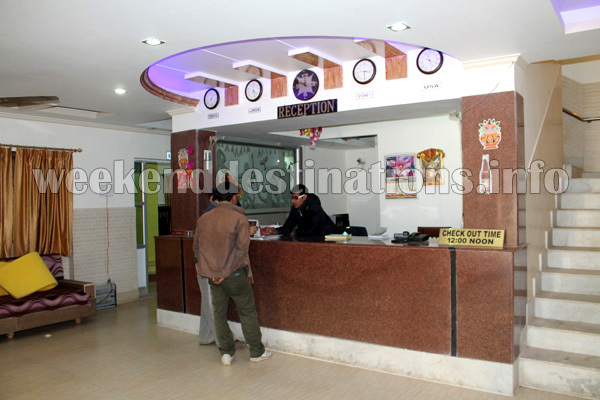 The hotel’s travel desk arranges for all sightseeing trips to Nalanda, Bodhgaya and Pawapuri and pick-up from Bakhtiyarpur Railway Station or other destinations like Patna. Food is essentially Indian and served in the dining hall. Hotel near Hot Water Spring: Just a walk from the Venuvan and hot water springs is this hotel with views of the surrounding hills. 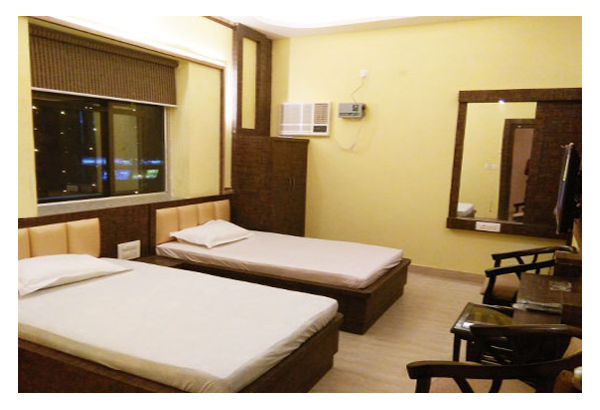 All standard modern facilities like rooms with attached western bathrooms, cable television, dining hall, car-parking, hot water geysers, reception, air conditioning, generator and wardrobes. Food is essentially multi-cuisine and served in the dining hall. The hotel also has a restaurant near the hot spring area.